HOUSTON (Reuters) – Demonstrators fanned out across North America this week, including in Missoula, to demand the U.S. government halt or reroute the Dakota Access pipeline as the companies behind the controversial project asked a federal court for permission to complete it. In what organizers said were the largest demonstrations to date against the pipeline, thousands of people rallied outside Army Corps of Engineers offices, banks and energy companies, a day after the Obama administration delayed granting a permit needed to finish the project. There were arrests in North Dakota, where the most heated protests took place. The $3.7 billion Dakota Access project has drawn opposition from the Standing Rock Sioux tribe as well as environmental activists who say it could pollute water supplies and destroy sacred historic tribal sites. Morton County Sheriff’s Department reported 26 arrests in Cannon Ball, North Dakota near the path of the pipeline, and said demonstrators attempted to block a railroad with a pickup truck then tried to set the vehicle on fire. A protest staged this week in Missoula was peaceful. 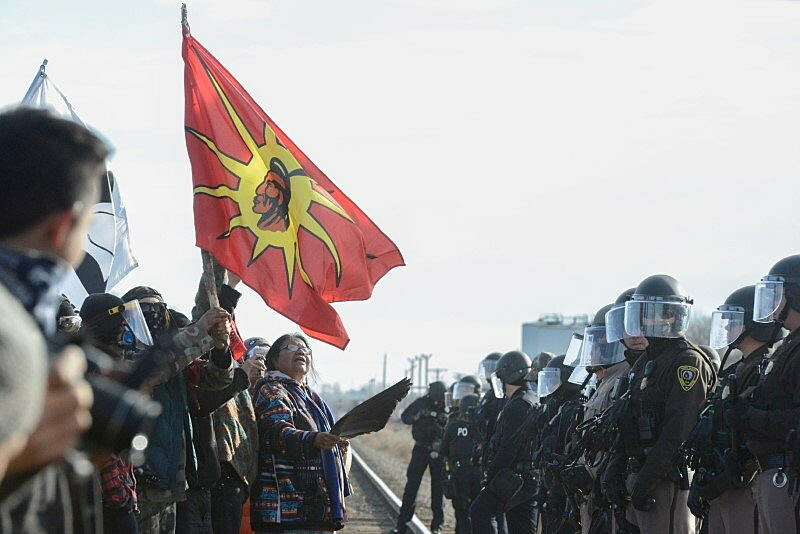 “Their job is to protect us, but instead they’re protecting corporate interests and profits and money,” said Cannon Ball protester Fumi Tosu, 38, of San Jose, California, adding that police used mace on demonstrators in North Dakota. “There’s real victims,” Kennedy told reporters at the Cannon Ball protest. Energy Transfer Partners, the main company behind the pipeline, is seeking an easement to tunnel under Lake Oahe, the North Dakota water source at the heart of the protests. On Monday the Army Corps delayed that approval, which was seen as a partial victory for protesters. Energy Transfer asked the court to declare that the project had the legal right to proceed and needed no further government approvals. “To propose, as the Corps now does, to further delay this pipeline and to engage in what can only be described as a sham process sends a frightening message about the rule of law,” said Kelcy Warren, Energy Transfer’s chief executive officer. Standing Rock Sioux Chairman Dave Archambault II said the companies were wrong and their legal action would not succeed. “Dakota Access is so desperate to get this project in the ground that it is now suing the federal government on the novel theory that it doesn’t need an easement to cross federal lands,” he said in a statement. The Army Corps said it plans to get more input from the Standing Rock Sioux in light of the tribe repeatedly being “dispossessed” from its lands in the past. Energy Transfer has said the 1,172-mile (1,885-km) pipeline, which is nearly finished, would be a more efficient and safer means to transport oil from the Bakken shale of North Dakota. The only work left in North Dakota is the segment to run under Lake Oahe. Analysts said they still expected the pipeline to be completed. “What is less clear is the startup date, and the exact routes,” said Afolabi Ogunnaike, senior analyst at Wood MacKenzie, a commodities consultancy. The protests came as Dakota Access was expected to win the support of President-elect Donald Trump, who has given strong backing for energy infrastructure projects. Warren donated more than $100,000 to the Trump presidential campaign. Between 650 and 700 people gathered in Chicago at the Army Corps offices. Over 250 people were at a Houston protest outside ETP’s offices where police handcuffed two demonstrators and put them in a police car, according to a Reuters witness. A Houston police spokesperson was not immediately able to confirm whether demonstrators were arrested. Chanting “water is life” as a jazz band played, protester Bridget Lois Jensen, a 53-year-old Houston resident, said Americans needed to wean themselves off fossil fuels. She was not hopeful the pipeline could be stopped. At Cannon Ball, Cindy Montanez, said she was disappointed the Army Corps delayed its ruling on the final permit. “It continues to push the decision into the hands of the next president, who has very clear interests in and support from the oil industry,” said Montanez, who travelled from Los Angeles with her mother Margarita to join the protest.